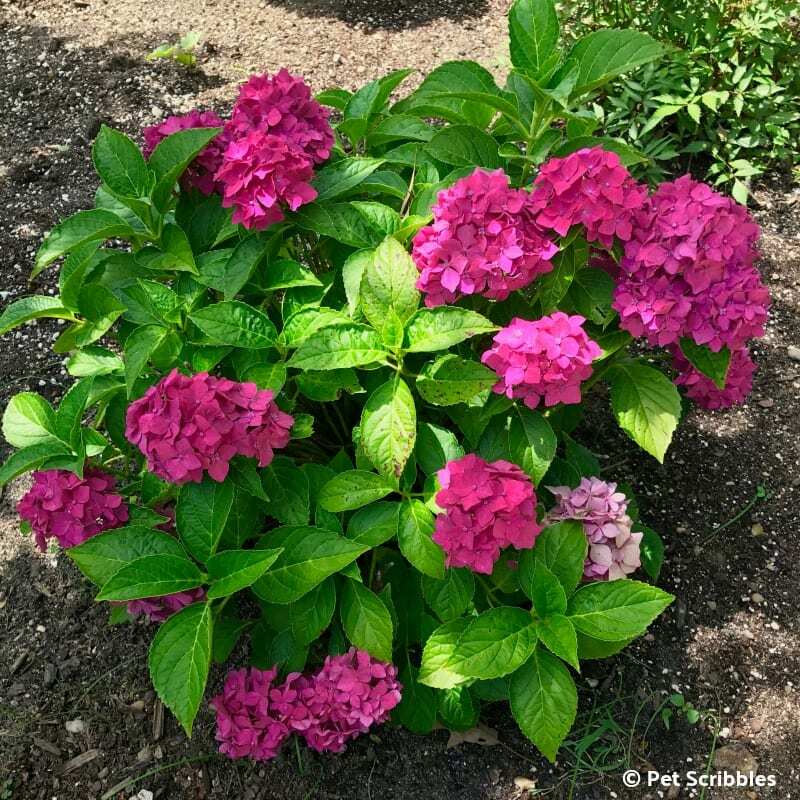 Pia Hydrangea is a pink dwarf hydrangea you will love! 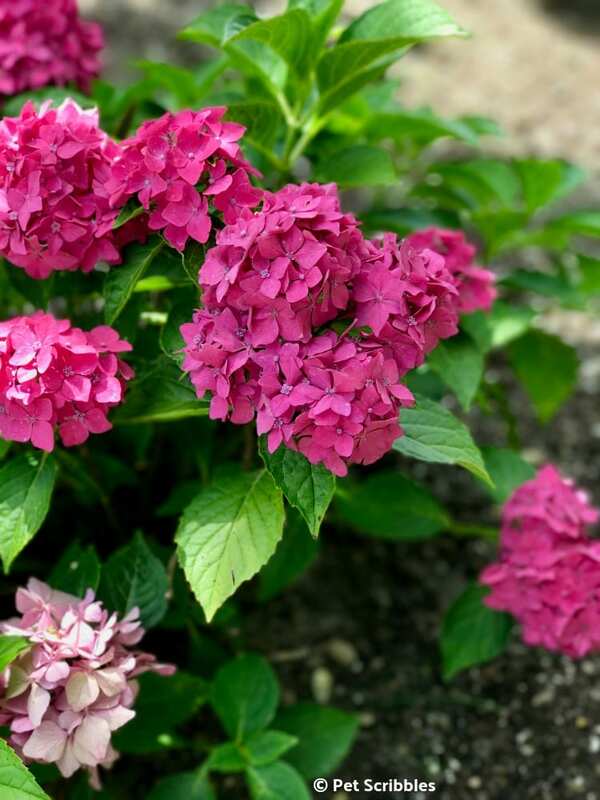 Learn how to care for this small hydrangea and why it’s a perfect size for your garden. I love Hydrangeas and always have, ever since I first saw the gorgeous blue Hydrangeas that were everywhere around Cape Cod and Rhode Island when I lived in Boston. Summer was official once I spotted those large blue flowering shrubs! 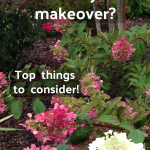 When we were planning our dream landscape makeover, I wanted all sorts of Hydrangeas in our front yard! We already had grown our own Endless Summer Blue Hydrangeas in front . . . 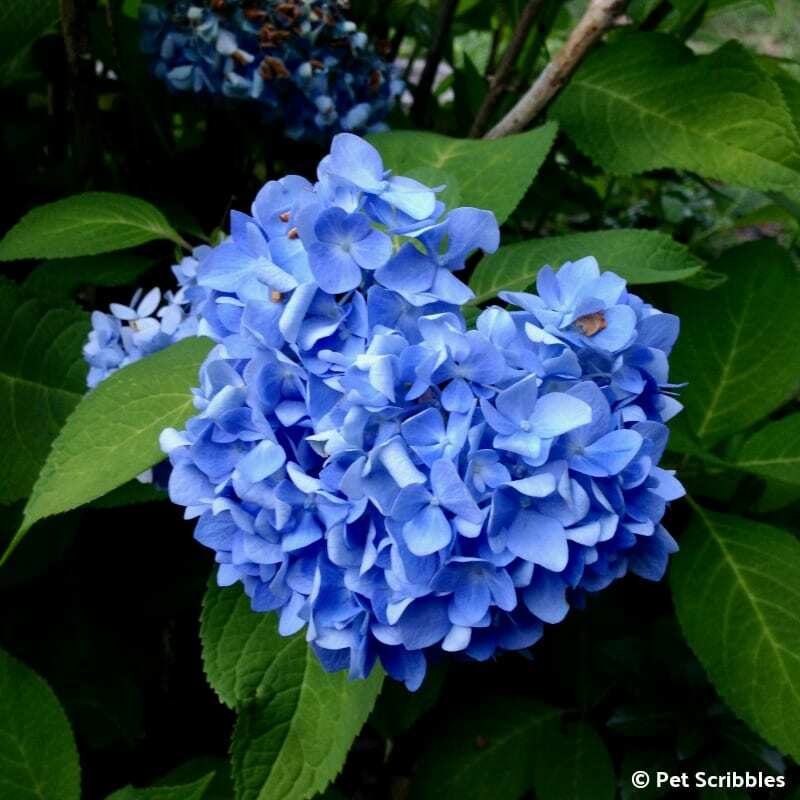 I knew there were several varieties of the bigleaf mophead Hydrangeas like my favorite blue ones. 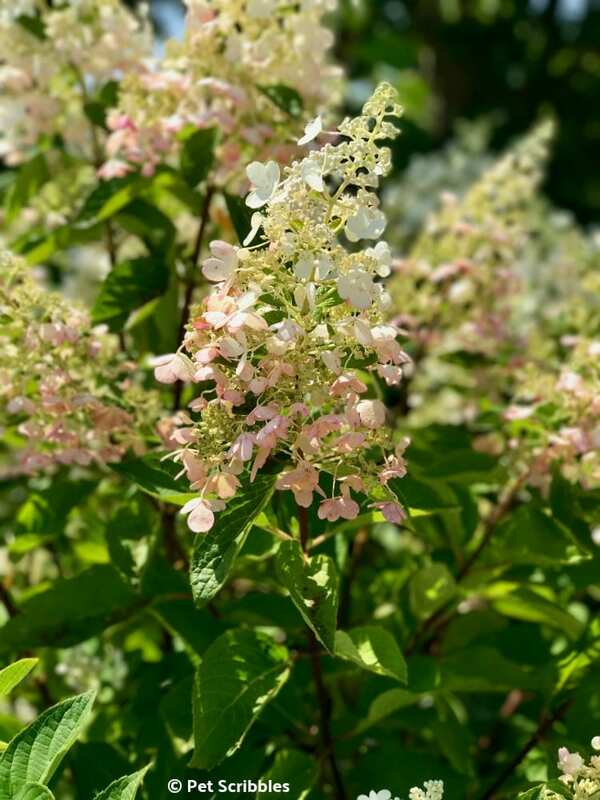 I also knew there were many versions of panicle Hydrangeas, such as our Pinky Winky Hydrangeas, which have flower heads that are conical in shape. Our Pinky Winky flowers began turning pink in late July this year! But I had no idea that there were — and are — Dwarf Hydrangeas! 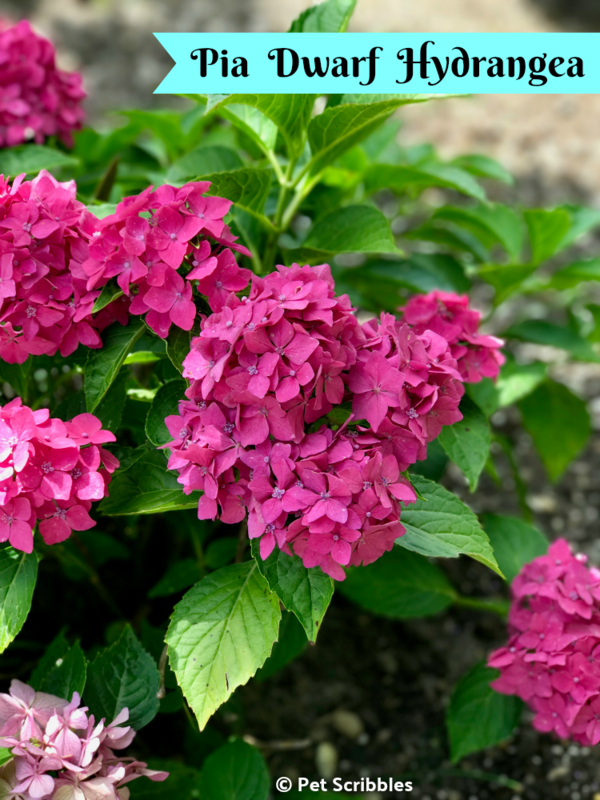 Just as there are round versus conical flowers on the regular size of Hydrangeas, you can find both styles in Dwarf Hydrangeas — and new varieties are being developed. 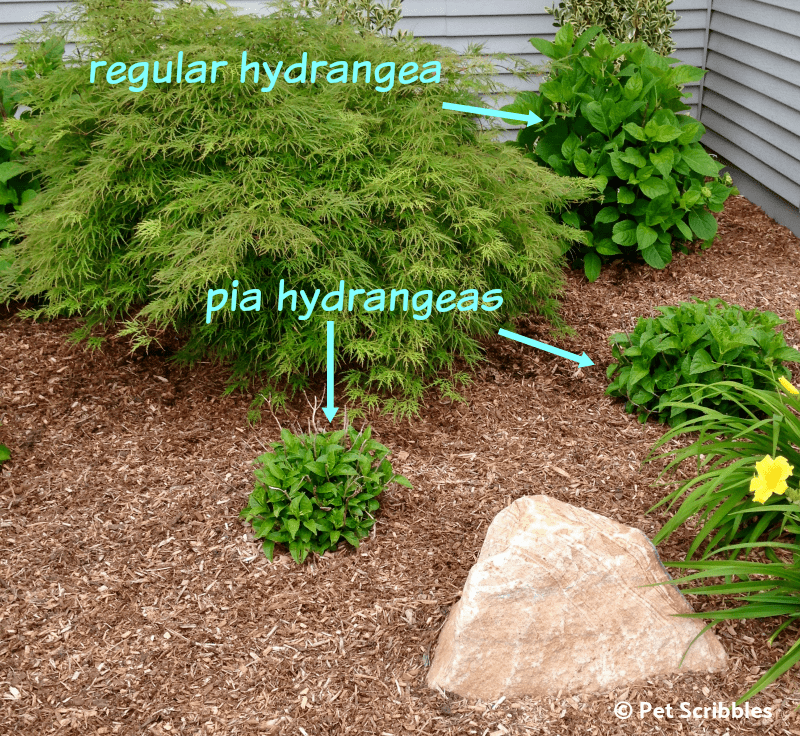 A Pia Hydrangea is the mophead — i.e. round, globe-shaped — variety. 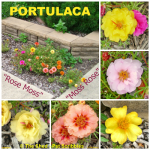 These are almost always pink in flower color, regardless of how acidic the soil is. Pia Dwarf Hydrangeas bloom on old wood, which I’ll explain below. 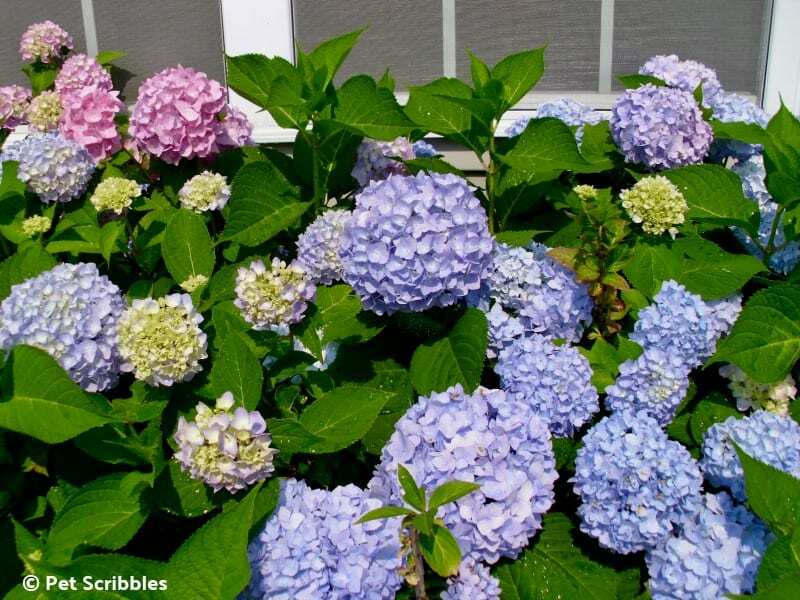 In general, Dwarf Hydrangeas are simply smaller versions of the regular, usual, normal-sized Hydrangeas. 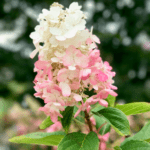 For comparison, a bigleaf mophead Hydrangea will typically grow between 4 to 6 feet tall and wide, while a Dwarf Hydrangea is usually around 2 to 3 feet tall and wide. Small Hydrangeas are perfect for smaller gardens and even containers. 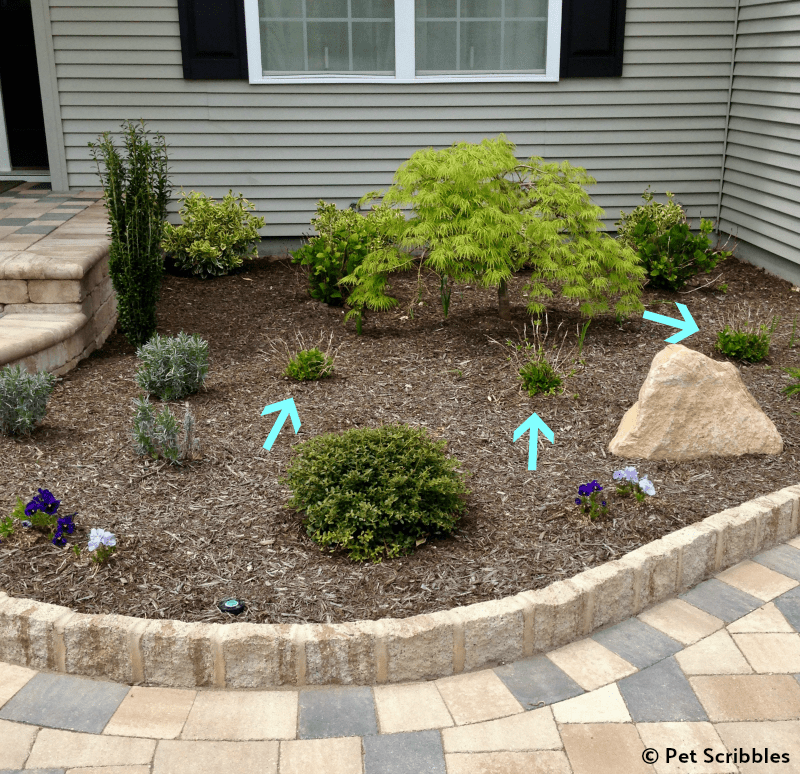 However, they fit into larger gardens too, especially as their dwarf size allows them to be front and center without blocking other shrubs and plants. 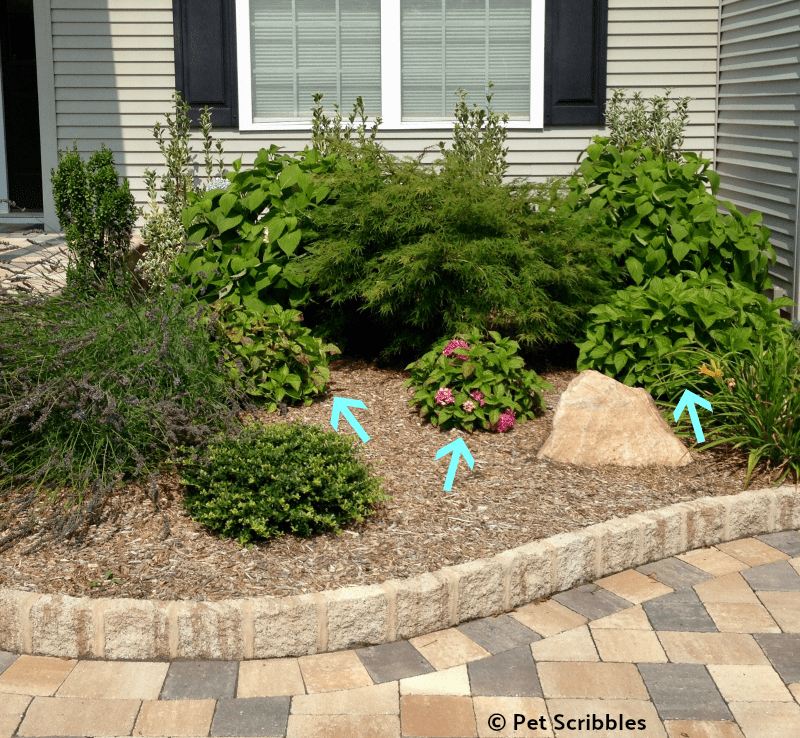 Once we learned about Dwarf Hydrangeas, we requested three of them for our front landscape makeover, specifically the beautiful rose-pink Pia Hydrangeas. Look at the first Pia Hydrangea on the left, above, and you can see the leaves have some brown on them. This particular one was planted too close to the Phenomenal Lavender, and had more black spot on it than flowers each year. 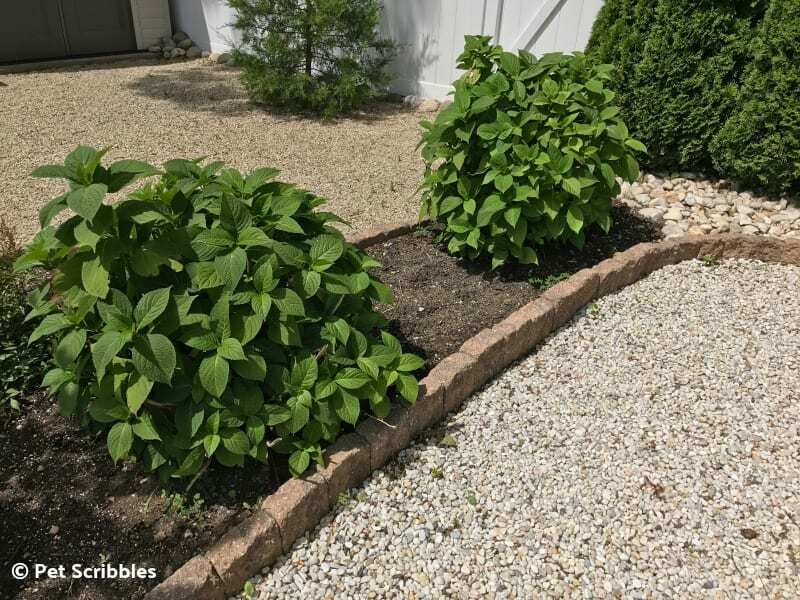 This year (2018), we transplanted the large and small hydrangeas into our backyard, where they will have more room to grow and hopefully thrive. I’m in the midst of redoing this garden bed, and have high hopes for how pretty it will look this time next year. 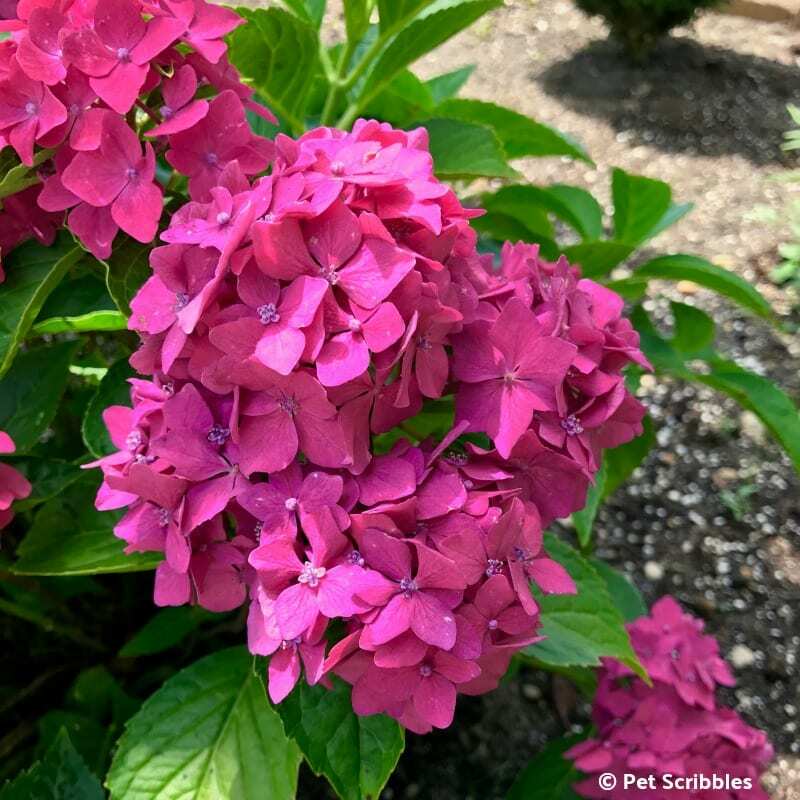 Pia Hydrangea blooms are a beautiful pink color — not pale pink or fuchsia, but a medium pink color with hints of rose. It’s a warm pink but not garish at all. It’s a lovely color! The flower heads are round, like a globe, and average 4 inches in diameter. Flowers stay pink no matter what the pH soil level is. However, just like other hydrangeas, these prefer an acidic soil to grow their best. The flower show put on by Pia Hydrangeas starts in mid-Summer and goes into the Fall season, depending again on your area and Mother Nature! 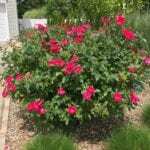 The beautiful rose-pink color will deepen as the Summer stretches into Autumn, which makes them fit into your Fall gardens wonderfully. I love to leave the flower heads on the stems to dry for Winter interest in the garden. It’s an easy way to dry them too, if you then want to cut them off and use for indoor dried flower arrangements. 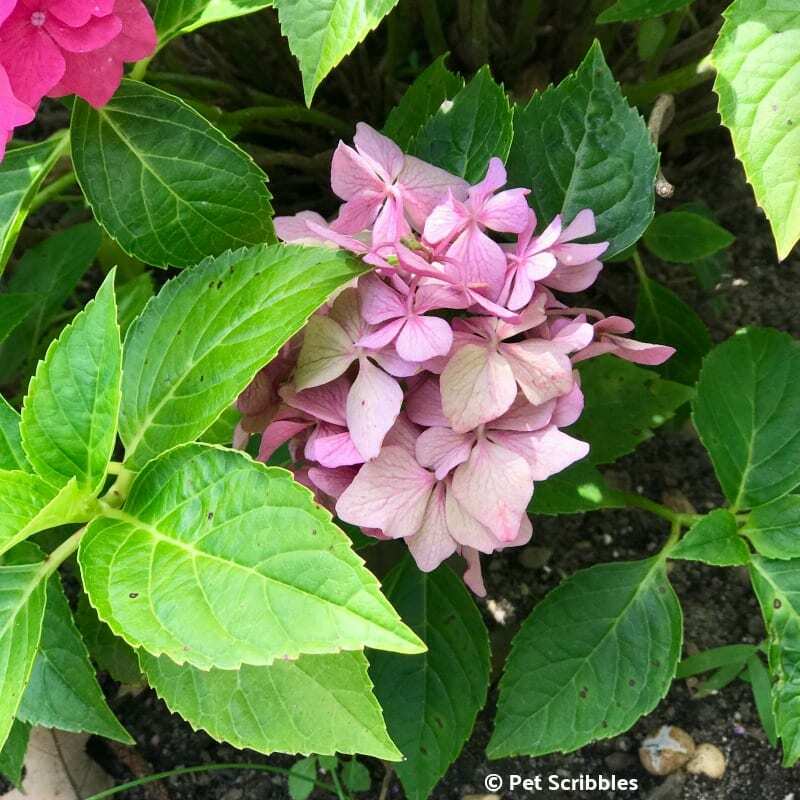 A Summer-flowering dwarf shrub, Pia Hydrangea is deciduous (not evergreen), and belongs to the mophead Hydrangea family. I’ve seen it mentioned as slow-growing, but I’m not clear what that refers to. For me, the shrub goes completely dormant each Winter. In the Spring, the new growth emerges on the previous season’s wood. In addition, there are many new shoots growing up directly from the base of the plant. The leaves look almost identical to the bigleaf mophead hydrangeas, as do the flowers. 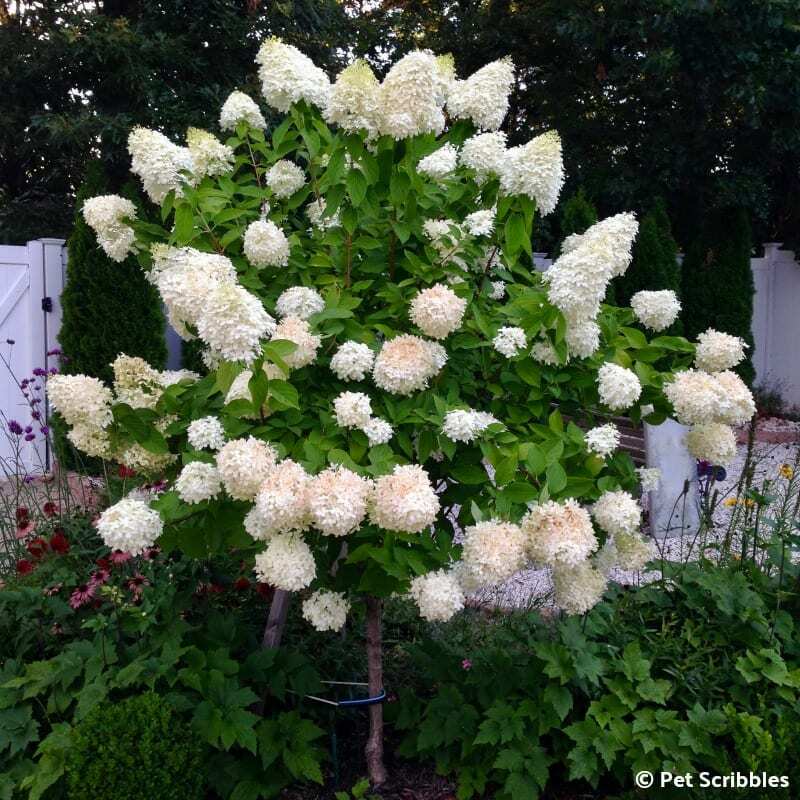 Just think miniature: the average size of a Pia Hydrangea is 2 to 3 feet tall and wide. Size can still be impressive, however, as I’ve experienced with the three Pia Hydrangeas we are growing. 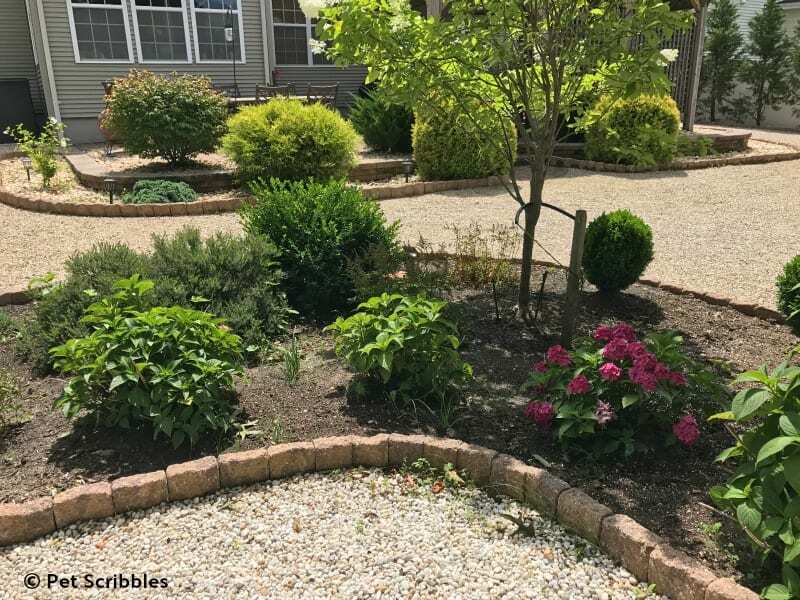 USDA zone is typically zones 5 through 9, however some of the hardiness depends on where you’re growing your Pia Hydrangea. If you are zone 5 or lower, remember to ask a garden expert at your local nursery for advice. They know your area’s growing conditions the best. 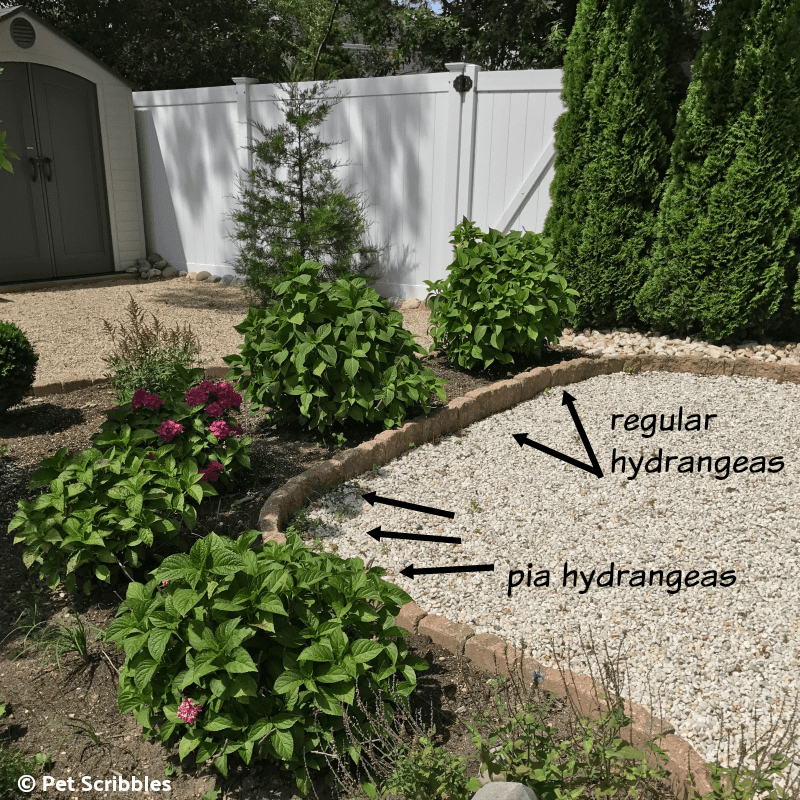 The best light for Pia Hydrangeas is partial sun to partial shade. Full sun is tolerated as long as there’s constant moisture. 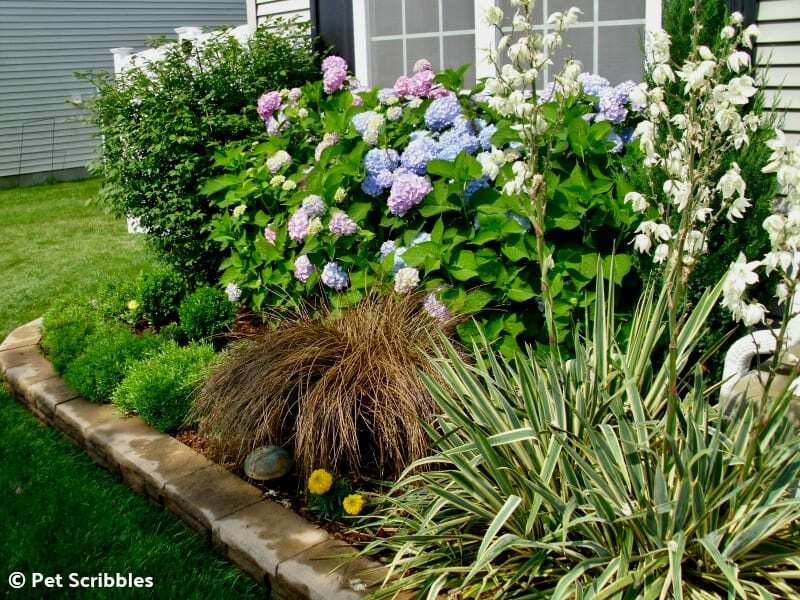 Regular watering is essential for Pia Hydrangeas to thrive. Always water more heavily when these small Hydrangeas are first planted to help the roots get established. You’ll know when the plant is thirsty as the leaves will wilt, but don’t wait that long to water. 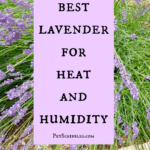 A little wilting is ok and normal in the heat of the sun, however when the leaves are really wilted, the plant is thirsty and a bit stressed. You want your plants to be stress-free and happy, instead of alternating between stressed and happy. 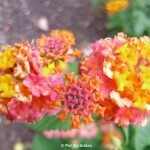 This happened to our Pia Hydrangeas when they were in our front landscaping for the first couple of years. My difficulty was balancing what needed water and how much. The large hydrangeas needed more water in the direct sun than the dwarf Pia Hydrangeas did. It drove me crazy! As the plants were growing too big for where the landscapers had planted them, my solution was to move them to our backyard. To control black spot on hydrangea leaves, try reducing the amount of water they receive. Also make sure that when you water, you avoid hitting the leaves directly with water too much. Snip off the leaves that are infected and throw them away. 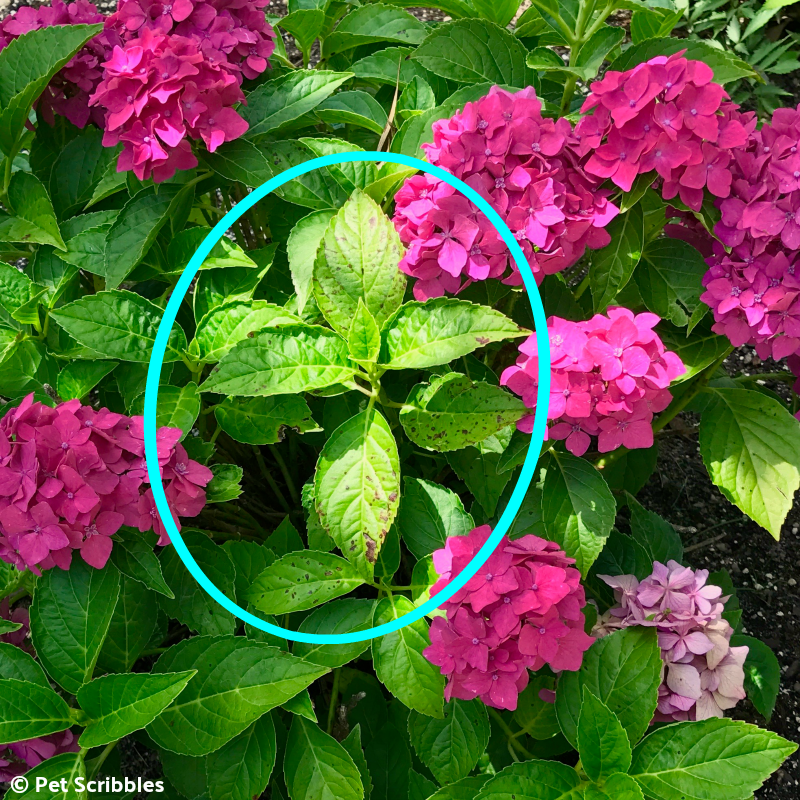 If needed, spray an organic fungicide on the hydrangea leaves. The flowers of Pia Hydrangea bloom on the previous season’s stems. This is usually referred to as “blooms on old wood”. If you want to do any pruning, you should do so after flowering. 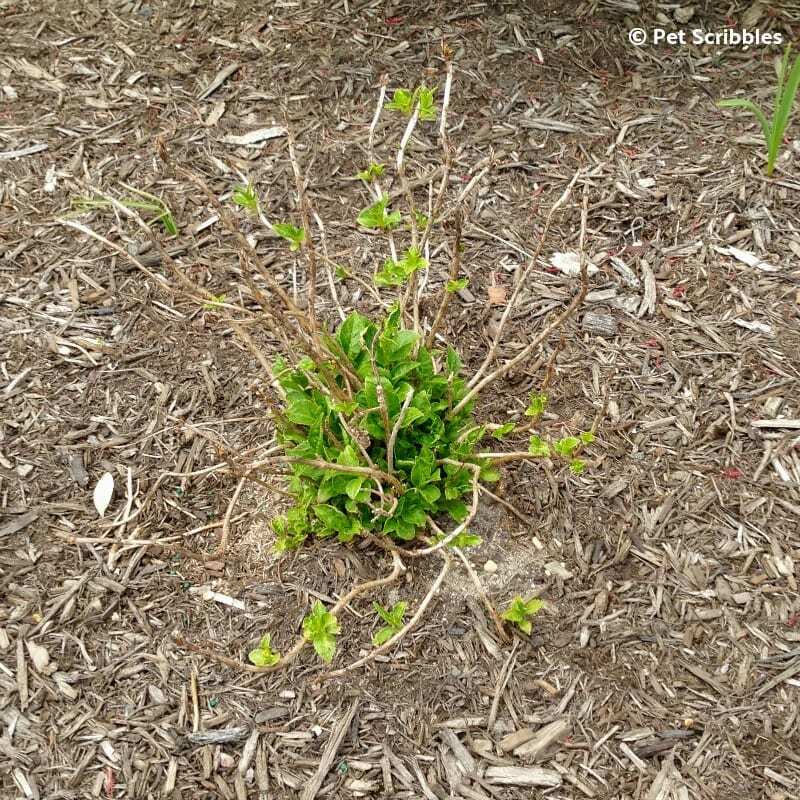 My suggestion is to prune in late Winter or early Spring. 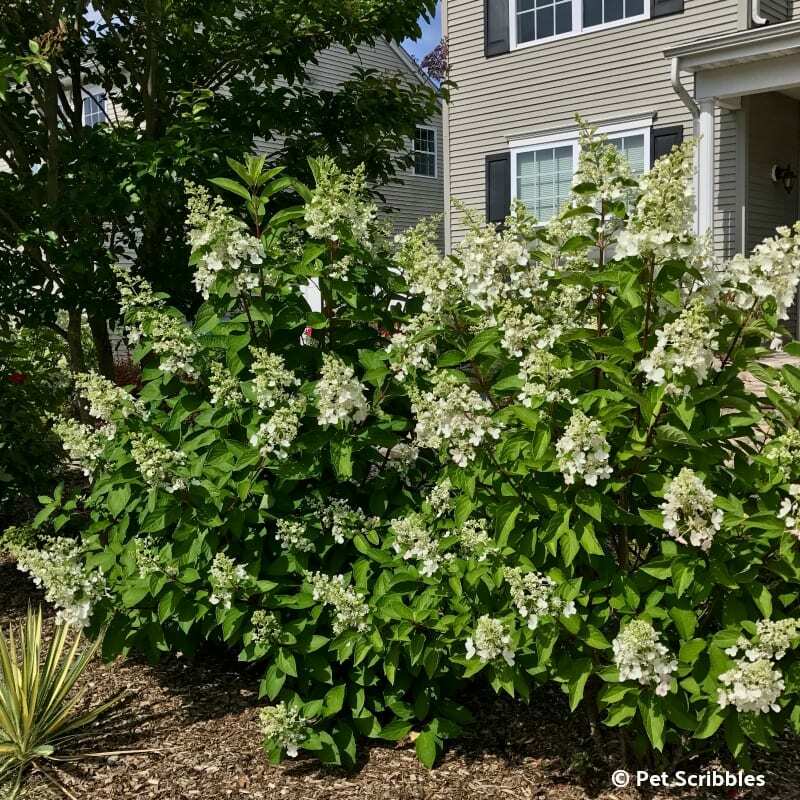 Because of Pia Hydrangea’s dwarf size, pruning for size is not an issue like it might be with other larger flowering shrubs. Prune any dead branches. Also prune any crossing branches that are touching each other. This will prevent both branches rubbing against each other, which can cause the plant to become infected. 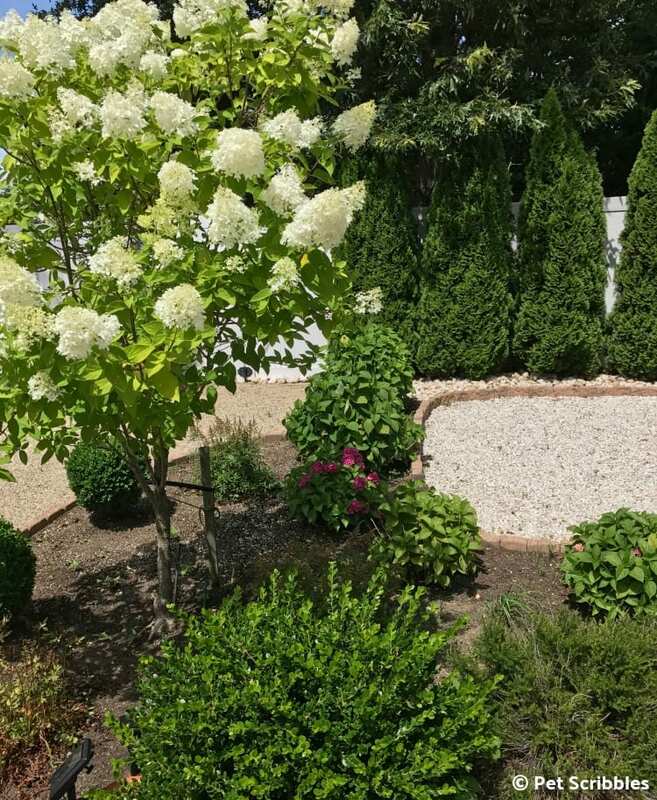 If you don’t think your garden has room for a full-size Hydrangea, consider adding a Pia Hydrangea instead!